Marketplace revenue represents the fees Etsy charges sellers to list items in the marketplace, the fees the company charges for transactions between buyers and sellers, and the use of Etsy Payments by sellers to process payments. 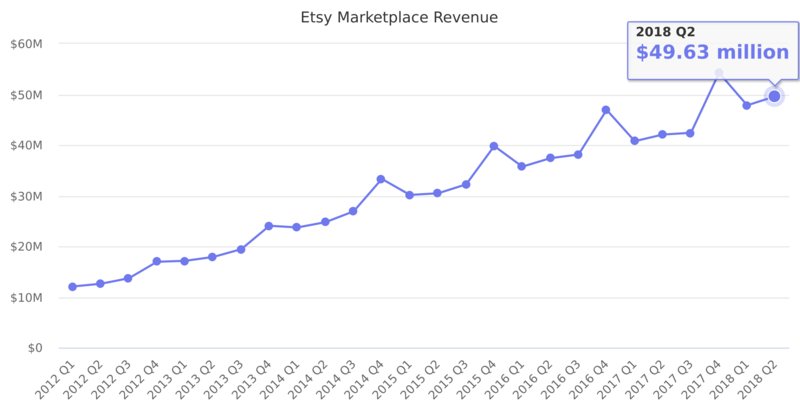 Revenue from Etsy Payments, Etsy's payments processing product, formerly included in Services revenue, is now included in Marketplace revenue because Etsy Payments is required to be used by Etsy sellers in the countries where it is available. Last reported quarter 2018 Q3 it was $110.93 million, up by 43% year-over-year from $77.81 million.